What is an Air Nozzle? An air nozzle is a device used control the direction or characteristics of air flow by converting pressure into flow. Air Nozzles are the smallest air amplifiers for point application. Nozzles are frequently used to control the rate of flow, speed, direction, mass, shape, and/or the pressure of the stream that emerges. In a nozzle, the velocity of fluid increases at the expense of its pressure energy. Air nozzles are one of the most common product used in a factory environment. They are primarily used for blowing off debris and liquid and for cooling or drying parts. It is also used for cleaning, part ejection, and conveying. The original compressed air operated engineered nozzle is a cone that provided the most flow amplification. They are useful for compressed air applications because they entrain surrounding atmospheric air with the compressed air. It is often a pipe or tube of varying cross-sectional area and can be used to direct or modify the flow of a fluid (liquid or gas). Inefficient air nozzles consist of an air exit hole for the compressed air at the end of a pipe attachment. The pipe usually has a small hole on the side to release compressed air and to reduce the dead end pressure and create a useful blow off force. Properly engineered air nozzles work by using the Coandă effect – entraining surrounding air along with the compressed air that exists a ring of holes and around the bottom or sides of the nozzle. The exiting air is a concentrated high velocity, laminar flow stream of amplified air. Standard cone shaped air nozzles, with air exit holes around the bottom of the nozzle, provide the best flow per unit of air consumption and are best suited for light blow off and cooling applications, thus providing a low-cost solution for the task. Modern engineered nozzles have holes on the bottom or sides with hole spacing, sizing, and internal design crafted to optimize for highest force per unit of air consumed. NOTE: Always use filtered compressed air to ensure the air supply remains clean and dry. In most factories/manufacturing environments, there are many types of nozzles that satisfy the requirements for specific applications. The challenge is to find the nozzle that provides the best performance at the optimal operating cost. Cone Shaped Air Nozzles are excellent flow amplifiers. They are used for cooling because they have high flow/CFM compared to other engineered nozzles. They dramatically reduce noise pollution in a factory and good for energy conservation. Cone shaped air nozzles reduce compress air cost by conserving air. They are compact and have a 10-dBA average noise reduction to improve safety in the work environment. They meet OSHA noise level requirements. Overall, these air nozzles will improve the production of your factory environment. These Air Nozzles replaces an open pipe from 2 mm to 0.5 inches and saves 30% in compressed air. Take note that not all cone shaped nozzles are equal as the internal design do impact performance. Air Mag Air Nozzles is a bullet shaped finned nozzle that has a unique patent design to focus compressed air from the supply line and entrained air from the surroundings to a sharper laminar flow of air with the highest force per SCFM than other bullet shaped finned nozzles on the market. They have the lowest air consumption for the force produced, lower noise levels, no whistling sound, are rugged and are made of a single piece for extra strength. 1/4” is the average size for air guns. This size is used for most applications and usually attached to a ¼” pipe or hose. ½” is for heavier blow off applications. It attaches to a ½” pipe or hose and is a common nozzle size that is used with large air guns. 4, 5, and 6 mm are available for small applications and usually attached to small copper tube and to smaller – often low cost – air guns. There is a 1/8” adaptor for the 6 mm nozzle to adapt it to 1/8” pipe as well. Flat Jet Nozzle is a compressed air operated chamber (flat nozzle, flat jet), which is a smaller length than an air knife. It also has a higher air force and flow design. The flat jet nozzle can be mounted on manifolds of different lengths (holding 2, 4, or 6 units typically or more). It is used when a much stronger forced air is required than an air knife can provide. They are very efficient and specially designed to provide a powerful stream of high-velocity laminar flow, high force for blow-off applications and cooling where air knives do not provide enough force. The air consumption and noise levels are minimized with the special design, which converts pressure normally lost as noise and pressure drop into useful flow and force. Shims can be added to modify the force. This type of nozzle is used for part cleaning, chip removal, part drying, part ejection, and air assist. Nex Flow take care in designing our flat jet nozzle and ensures that it meets the OSHA noise level requirements. Ring Ionizer-Ionizing Nozzles discharge and clean surfaces of non-conductive materials by incorporating an anti-static pin. For manual use, they can be mounted to a hand gun. Laval Effect Nozzle uses an hour glass exit for the existing compressed air to accelerate the exiting compressed air. While they are supposed to reduce overall noise, they tend to have a higher-pitched noise. If the nozzle is not close to the target blow off, the force tends to dissipate. For this type of nozzle – both the noise and effectiveness are questionable compared to a nozzle using the Coandă effect. Spray nozzles that use compressed air produce a very fine spray of liquids mixed with the compressed air. They include atomizer nozzles, and air-aspirating nozzles. Choosing the material that the nozzle is constructed of will determine the wear of the unit. Nozzles, over time, could begin to clean a surface unevenly or over-spraying, which wastes chemicals, water, energy, and operating costs. Anodized aluminum is ideal for blow guns and for part ejection of heavier viscosity liquids. 303/304/316L Stainless Steel is often used for liquid and light weight part blow-off applications for food, pharmaceutical, and corrosive environmental applications. 316L stainless steel is more expensive but worth the cost when the manufacturing environment has high chloride and salt exposure. Cast zinc is a rugged and provides extra strength for use in harsh environments. Plastic nozzles is of lower cost and is often used but can easily break and in some applications may be dangerous with the risk of breaking. Copper or brass are optimum choices for blow-off nozzle materials since they have low friction coefficients. Using air nozzles, replacing non-engineered air nozzles, or replacing old nozzles with more efficient products can save significant operating costs by using compressed air more effectively. There is also an average 10 dBA reduction in noise and meets OSHA standards, which improves the working environment. Nozzles provide precise, repeatable drying and blowing off capabilities for all applications. Copper tube can be attached to some nozzles to aim direction of the flow. The copper tube is pressed fit into the customer’s existing system. Rigid flex hose can be bent into shape to aim the nozzle at the target. It is an all stainless-steel hose that does not break after a few bends like competitive rubber hoses with simple copper inserts. The stainless-steel construction allows for use in any difficult environment. Rigid flex hose nozzle is resistant to creep and crimping. 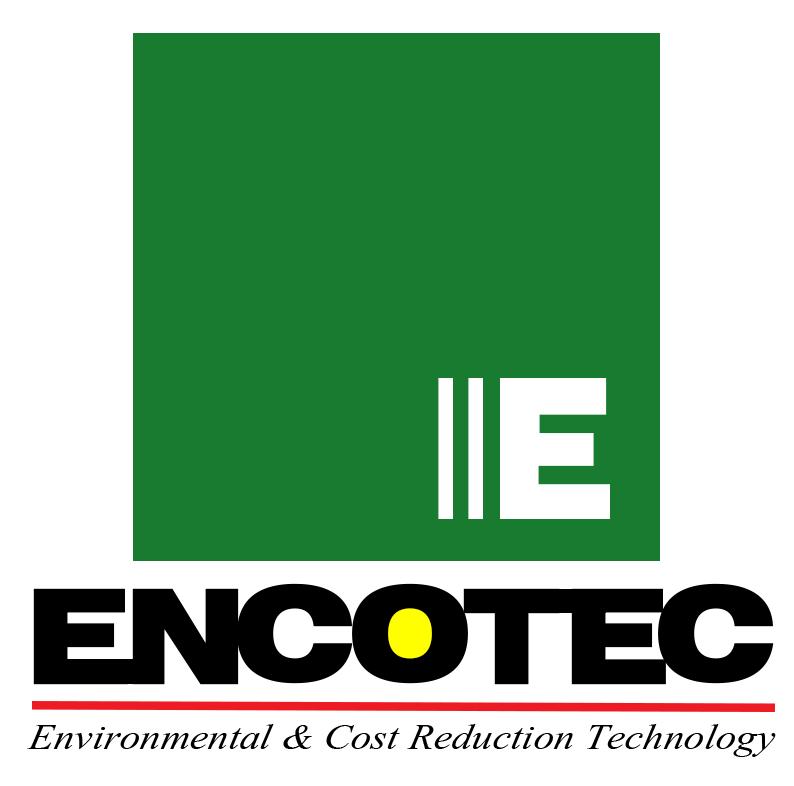 When considering an engineered nozzle, there are several factors to consider. It is recommended when reviewing specification, to research the distance the force/CFM were taken and the line pressure. Determine if the force and pressure is suitable for your application. Test and use brands known for improved performance and quality, such as ours. Stay wary of copies and ask if you need continuous or intermittent air supply? Don’t forget to consider sensors and timers when applicable for energy savings. Other than the nozzles themselves – it is also important to consider the compressed air piping system to ensure efficiency. Some materials are corroded by lubricants from the compression process, which leads to leaks and particulates in the air stream. Copper, brass, steel, and aluminum are optimum choices for nozzle materials as they have low friction coefficients. 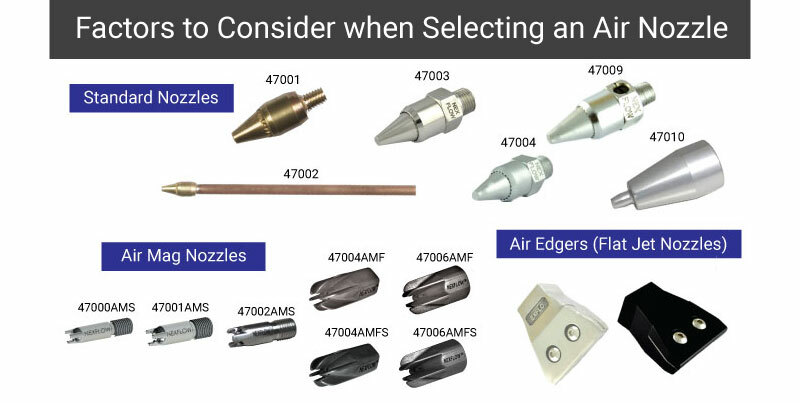 How do you determine the best nozzle for the following applications? For cleaning applications, choose a nozzle that has the highest force/unit air flow (Force/SCFM ratio); such as the Air Mag nozzle. It is also essential to consider the air consumption. A regulator can be used to cut back the pressure to set the required force. Any additional force above the requirement will use more energy and cost more. Air pressure loss will result when putting compressed air through a pipe attached to a nozzle. The higher the air flow through the pipe, the larger the pressure drop and pressure at the entrance of the nozzle. Any extra pressure (for example, 1 SCFM) enters the piping that is the same size as the nozzle – will cause the pressure to drop at the entrance of the nozzle. Therefore, for cost savings, it is imperative that the correct pressure/force is determined at the entrance of pipping attached to the nozzle so that there is no pressure drop when the compressed air enters the nozzle. The reduced air pressure/force will also have less noise pollution and will provide a safer manufacturing environment for your employees. Air Edgers (Flat Jet nozzles) are also popular for cleaning flat or curved surfaces and have the advantage of having the force varied by adding/removing shims, which control the air exit volume and force. Other factors that can negatively impact spray nozzle performance are plugging, erosion, corrosion, scale build-up, caking, accidental damage and improper assembly. These are common in washing and rinsing operations especially when caustic solutions are being used. Establishing and implementing a nozzle maintenance program is the most effective way to prevent and minimize costly spray nozzle problems. Static Control – Ion air nozzles/Ring ionizer nozzle are highly effective at discharging and cleaning non-conductive materials. These nozzles can be mounted on handgun for confined workspaces. These are flexible, light, and easy to use for discharge processes. When nozzles are used for drying, the traditional cone shaped nozzle is recommended. For larger applications where a number of nozzles are required, more energy will be saved when using the Air Mag nozzles. Anodized aluminum or 303/304 Stainless Steel standard strength nozzles with 1/8”, ¼”, male NPT connection is ideal for blow off applications involving liquids. Model 47001 is designed to fit into small spots and is used by many machine builders for blow-off applications. Model 47003 (anodized aluminium) Model 47003S (303/304 Stainless Steel) and Model 47003S-316L (316L Stainless Steel) –with a 1/8” male NPT connection is ideal for most blow-off applications involving liquids. Air Knives are like rows of linear air nozzles that can be made to very long lengths. Air knives provide uniform air flow across the entire length of the air knife. It provides high velocity and constant air stream for fast drying and blow off in a factory setting. Air knives are maintenance free because there are no moving parts. They are safe because they have low noise pollution. Air knife kits are available, which include an air knife, extra shims, filter, pressure regulator, and gauge. Use standard cone shaped air nozzles that are efficient at converting pressure to flow is a good choice when selecting nozzles for cooling. These nozzles are better for cooling as they have less force/CFM but more flow/CFM than the more engineered nozzles. Round air amplifiers, which are essentially very large low pressure but high-volume nozzles, are ideal for cooling molded parts and castings. They move large volumes of air using a small amount of compressed air, so they are economical to operate. Model 47004 (anodized aluminium) Model 47004S (303/304 Stainless Steel) and Model 47004S-316L (316L Stainless Steel) are strong force and high flow amplification nozzles with a 1/4” male NPT connection is ideal for most blow-off applications involving liquids and even light weight parts and used often for heavier liquid. The 47010 is a higher force nozzle but has less distance for laminar flow than the 47004. Anodized aluminum ¼” female NPT fitting nozzle with Coandă profile results in extremely strong force at a distance. This nozzle is good for blow guns. It has higher force for less distance for laminar flow. Nex Flow manufactures specialized compressed air solutions that are easy to install and reliable. All products offer noise reduction in factories to enhance the safety of your environments. 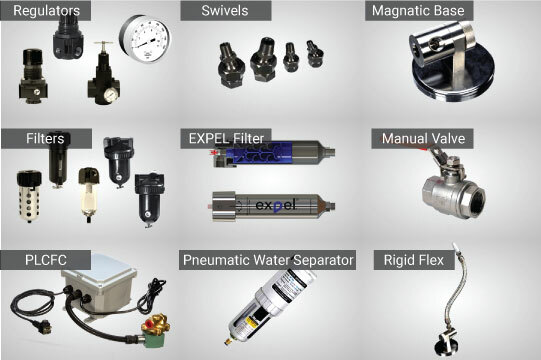 Nex Flow manufacturers high quality, economical, specialized compressed air solutions for blow, off, cooling, drying, and moving with representatives worldwide. Choosing Nex Flow means that you obtain the best customized solution, including full technical support. Our customer technical support provides blowing angle and direction tips during installation. All compressed air blow-off, moving, and cooling units products have a five-year warranty against manufacturer’s defects.